xStarter Web Pilot will help you to automate each and every process in your computer. Additionally you will be able to create, edit and control tasks from remote computers via Web. With Web Pilot it will be possible to create, edit and run tasks on remote computers, view tasks and tasks logs, enable and disable tasks. Tasks from remote computers can be created and edited direclty on local computer. Additionally this tasks be downloaded for local editing and use. It's possible to upload edited tasks back to the remote computer. To control remote tasks, you don't need any additional software. 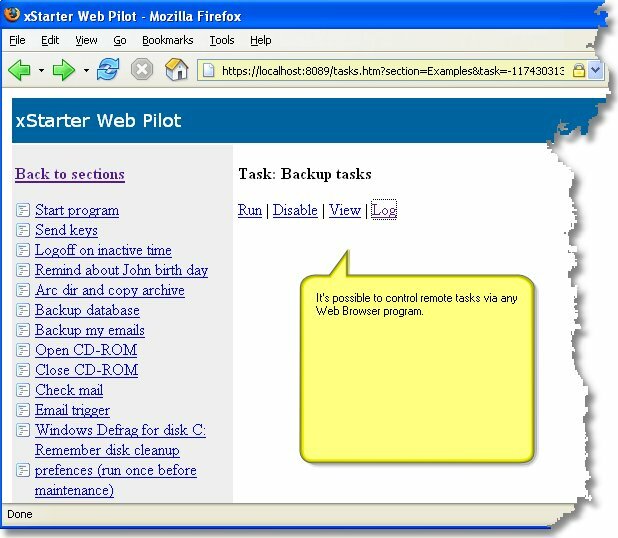 The Web Pilot version contains an integrated HTTP server, so it's possible to control your xStarter tasks from any PC with an Internet browser. Additionally, you can also start your tasks from another web server and from PHP, Perl, ASP scripts. xStarter tasks can play the role of Server side scripts. You don't need to know PHP or Perl to create PC automation scripts. Each Web Pilot task can receive commands from Web forms. xStarter Web Pilot contain full support for Secure Sockets Layer (SSL). It's possible to limit access to your PC using special IP address list. Quick start to control tasks from Web Browser. All parameters can be changed in the program Prefences.